My car wont start and i knew i needed a new battery. Im pretty sure its a battery problem since when I charge it with my battery charger for 12 freakin hours and still the charger says: "charging..." now, usually after 6hours of charging, my charger will say: "charged" on the status. So again I charged it for another 6hours, still its "charging..." so at this point something is wrong with my battery. So I eliminated other issues like maybe it could be the starter, alternator, etc etc and other stuff. It has to be the battery. So anyway, I have 3 choices: buy at the nearest store in my house since i already removed the battery, i only need to bring it to the store and get a new battery then install the battery myself besides im more of a DIY guy. i mean i could save $30 or more by doing it myself besides ive been doing this thing myself. I have a little background on automotive repair. So yeah, i have 3 choices: a.) buy at canadian tire, b.) call BCAA and have them install it themselves at my house. remember i cant drive anymore and c.) go to Kal Tire and try their DieHard battery for the first time. Im intrigued with their line of battery that i wanna try it. My real first choice is Kal Tire. But here is the problem, when I called Kal Tire No.5 Road the service advisor told me there is a $35 installation fee (like i really need it) for their $128 new battery so that makes it $178 for the whole service. I insisted I just need to get the new battery and install it myself and the guy on the phone told me, there will be no warranty on the battery if I do that. Like really? Thats how you sell your service guys? Really? Do they really think I would get their new battery, replace it with a bad battery at my house and come back to their place and tell them their battery is bad? Those battery has freakin unique serial numbers on them. Remember, I even have to bear the hassle to carry the battery myself and use public transport and my battery is freakin about 15kg heavy man. So basically the "if you install it yourself, you will not have a warranty" just killed my business with them Kal Tire. Honestly I think that was rather stupid. So I thought of other options, Canadian Tires Motomaster battery series.. I dont have any experience with them batteries and I heard a friend told me its not a good battery so my last option is just call the services of BCAA. And well, I called BCAA told them my problem and after 16 minutes a towing truck came to my place with a new battery (the battery has new brand its basically a "BCAA" battery as the label is "BCAA" lol) and the towing driver checked my old battery (he said the battery is toast, so see I was right) so he installed the new battery and charged me $164 for the whole process (Well the battery is $145 plus taxes=$164). Basically you do the math: BCAA is even cheaper than Kal Tire and I dont have to go to their store. That is the end of the story. And yes, my car starts now. Not the worst but.... Basically the prices are bad. I had them look at a tire which they took off and then wouldnt remount for safety. I get that... I ordered one through them and before it came found out they price matched. I was told that they only do for a full set and also that I need a written quote from the other business. Umm even when its advertised online??? I came away disappointed, and I wouldnt do business with this location again. If you go, expect to not get great prices, and if you are set on great prices make sure you haggle up front. But if it were me- why waste all your time trying to get a fair price? Go a few paces down the road to 1010tires or some other competitor and just get a good price to start with. I mention 1010tires only because they had a better version of the same tire and it was $50 LESS. I pointed this out but it fell on deaf ears. At the end I asked the guy if there was ANYTHING he could do for me, and honestly after being a Kal Tire customer for 10 years I sort of expected something... Nope. And hey I get it- he doesnt have to. A smart business move would have been to at least match the other price or do something in between and you know what? I would have still returned. The staff were friendly and professional and if you go they will be helpful and friendly as well. Your pricing will be poor probably though if you care. I ended up swapping that car and now have a truck. 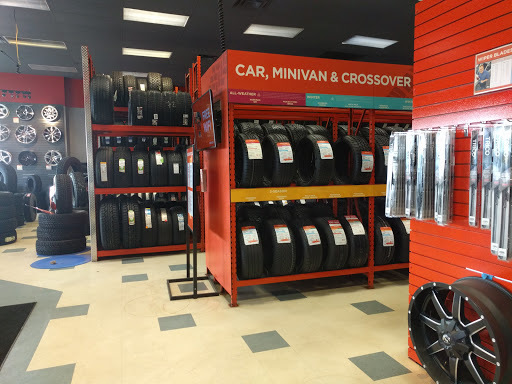 I bought an entire set of tires from Fountain tire on Clark Dr. I dont recommend just any location of Fountain Tire because I called around and others dont have the service I expect. But I DO recommend the guys on Clark. I saved close to 1k because they were willing to deal. Live and learn. I know where Im going to go for the rest of my life until proven otherwise though and its not this Kal Tire. Seems like a short sighted business move to bend me over for a few dollars and lose out not even a month later on a full set of very pricey tires that I bought elsewhere because I got the run around on pricing. But thats their choice. And I ve made mine. Update: I went back to get my brakes done and without mentioning my previous experience and had excellent service. I gave them a warrantied tire to be replaced and made an appointment for later that week. They said they would order the tire and put it on at the appointment, I go to the appointment, drop my car off and an hour later get a call that they forgot to order the tire. I have to make another appointment for the next week to get my tire replaced. When I go to pick up my car with one customer at each of the two employees on cash it took me over thirty minutes to just pay (I was the first in line). One of the guys in front of me was standing at cash so long that he had to leave to go to the bathroom. The whole store just gives me the feeling that they dont care about their customers at all. To be fair another one if my tires was punctured the day before my appointment and they were proactive and had ordered two tires after they made the mistake with the first one so I was able to get the second one on short notice. And they also did apply warranty to my tires so it was reduced in price. Great service and to my pleasant surprise, had my flat repaired for FREE! My flat was quoted several hundred dollars to replace at the dealership. We thought wed check out KAL tire to see if they are able to repair instead. Despite being a very busy Saturday, I was told they will try their best to have the job done by the end of the day. Due to a missing wheel lock, we didnt make it back until 15mins before closing. Without any hesitation, Diane the sales rep still agreed to help me out even though it might mean overtime for them! The mechanics were very pro and had the job done within half an hour or so. There is a popcorn machine at the waiting area and they even offered me donuts that some customers had dropped off. Must be another happy customer!